Good Luck, Hillary, Holding Him Up! 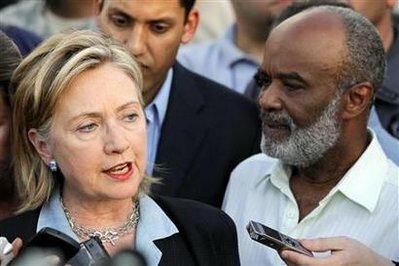 Hillary Clinton is many things, but she is not God, and while she may have been Préval’s Fairy Godmother on January 16 when she flew down there, met with and stood by him, she has way too much on her plate to be his full-time puppet master. 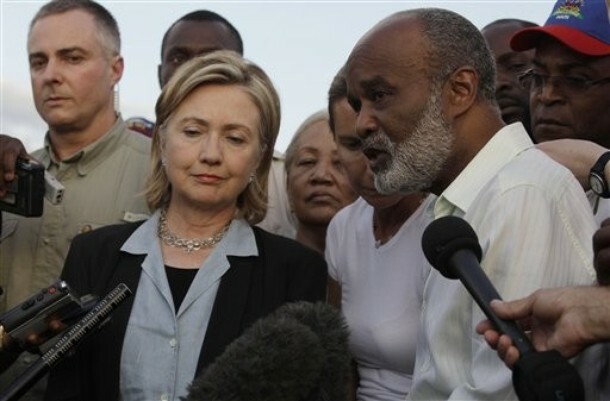 I am certain she told him (she certainly MODELED the behavior when she specifically spoke to the Haitian people) that he needs to make contact with the people who elected him and are looking to his leadership at this dire time. There is no excuse for him to have waited 18 days before going to the Champs de Mars to see the National Palace – unless it was that he knew that this was the main camping area for the dispossessed of Port-au-Prince, and he did not want to confront them. In fact, according to this story, it WAS the Palace he went to see, not the people. Yes, I know, he lost his house too, and he is “working” on organizing the government response, but given that the people on the Champs de Mars have no homes, no TV, and no way to know what he is doing, he should have been out there EVERY day, if not before Hillary visited, certainly after. 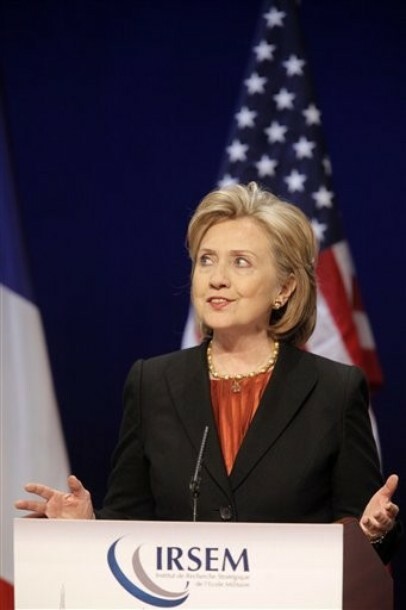 I am tempted to say, OK I will, I know Hillary Clinton, and you are NO Hillary Clinton, President Préval. She would have been working, as you have been, but she also would have made sure the people knew she was there for them. She always makes time for the people everywhere she goes. You should have followed her example with your own people. So! You waited more than two weeks, and they shouted you down, feel they have no leadership, and want an international takeover. Nice work! Meanwhile, my very consistent, dedicated, and balanced Secretary of State is regularly putting forth this message. Good job, René! Fifteen minutes a day would have done it, but now I think you have lost them. They are sorry they elected you. The international community does not want to take over your country, it wants YOU to! Haitian President René Préval walked over to the palace gates on Saturday — and was met by hundreds of people who rushed the gates to shout demands and voice frustrations with him and his leadership. He stood on the inside listening for more than 20 minutes as the throngs screamed. Saturday’s public appearance was one of his first in the 18 days since the quake. In interviews with The Miami Herald, Préval said he has deliberately avoided touring the ruins and has chosen to spend his time coordinating the nation’s response. When he showed up unannounced on Saturday, Haitians were startled — and angry. GOLLUST: Madam Secretary, I have a question left over from the London conference on Afghanistan. Before your news conference, several of us reporters talked to the women’s rights advocates from Afghanistan. They expressed some real concern that the reconciliation process contemplated by [Afghan] President [Hamid] Karzai might mean that their interest would be sacrificed in the interest of some accommodation with Taliban people. I know the United States won’t be involved in the reconciliation, but is there any kind of assurance you can offer them that their interests might be protected? CLINTON: Well, David, I share that concern, which is why I have not only spoken with a number of Afghan women and listened to their concerns but also to President Karzai and others about them. There is certainly no intention for that to happen. But, we have to be really vigilant to make sure it doesn’t. The idea behind the standards that would be used for reintegration and reconciliation is that people would enter society in a way that required them to abide by the laws and constitution of Afghanistan, and which provide for equal treatment of women. I do think we should put this in the larger context, which is that, unfortunately, discrimination against women exists even without the Taliban in many parts of Afghanistan. So, I don’t want to sound any alarms yet, because we are just watching the beginning of this process. But, I do want to assure your listeners that the United States is committed to protecting the rights of all people and we pay particular attention to vulnerable populations, like girls and women in Afghanistan. CLINTON: Well, I don’t think that the facts support that. I think, making it possible for Central and Eastern European states to feel secure, to join NATO if that is their choice, creates a compact of nations that are working together to enhance security. NATO has no offensive interest in taking action against any peaceful neighbor. In fact, NATO has a great interest in working more closely with Russia. Because, we believe that, in the 21st Century, the challenges are not between states so much as they are between states that are committed to peace and prosperity and non-state actors and rogue states, and Russia’s confronted a lot of insecurity internally on its own border. And, I think it has helped Russia not to have to worry about its neighbors to the West. Russia has to decide how it interprets developments like the expansion of NATO, but I would like to see a very close relationship between NATO and Russia that I think would continue to benefit all the parties. GOLLUST: What’s your level of concern about the state of democratic freedoms in Russia? Many people think it’s deteriorated since the Yeltsin years. CLINTON: I think there are some unfortunate trends in both democracy and human rights and also in development. Russia’s life span is going down. This is a great country with an extraordinary history and very intelligent population, well-educated. So, I think that Russia has some work to do at home, which I believe President Medvedev recognizes. He has spoken about, he’s written about it. And, I think, in the long run, it is in Russia’s interest to be more open and more tolerant of dissent, and to continue working to expand its free market and join the world trade organization and all of the other aspects of modernization, which really should help Russians. CLINTON: No, because it’s a decision for a country to make. Nobody is forced to join NATO; it’s only if a country wishes to apply for membership, and if there’s a change in political leadership, in Ukraine, and the Ukrainian people decide that they, at this time, would prefer not to pursue NATO membership, that’s their choice. GOLLUST: You also mentioned in the address the continuing United States concern about Abkhazia-South Ossetia. Doesn’t, in fact, the fact that Russia practically, or physically occupies these areas really preclude the possibility of NATO membership for Georgia? CLINTON: No. Georgia is in a process to see if it can meet the standards for membership. There’s certainly not a recognition in Europe or the United States, or among NATO members of the legitimacy of the secession South Ossetia and Abkhazia. We would hope for improvement in the relationship between Russia and Georgia, and a cooling of any tensions and a refraining from provocation. But, this is one of the areas that we’re working on. GOLLUST: One of the more moving events, I thought, at the State Department a week ago, was your meeting with the prime minster of Moldova. His comments about how grateful he was to become an MCC [Millennium Challenge Corporation] member and how proud he was about democratic reform. Is there something that the United States and/or other allies do about the territorial issue in Moldova that really has been an impediment to that country’s progress? CLINTON: I think there are and we need to be looking at the tsunami, the terrible earthquake in Haiti, and figuring out what are the best ways for the international community to respond. I’ve started discussing this with Catherine Ashton, the new High Representative for the European Union: how do we prepare to take responsibility for different parts of the world, how do we stockpile goods, how do we assign different responsibilities among different nations? I think this is a ripe area for more international cooperation and we should not just respond, we should learn and do it better the next time. CLINTON: Well I hope not. But there shouldn’t be any surprises on either issue. The United States has supplied defensive arms to Taiwan for many years. We do it within the context of our Taiwan Relations Act and the Joint Communiqué and our commitment to a one China policy. We think it is appropriate and in fact we believe that providing defensive equipment has actually enabled Taiwan to feel more comfortable in drawing closer to China in commercial interactions. And the last three, maybe four presidents have met with the Dalai Lama, so again there shouldn’t be any surprise. We certainly don’t recognize any claim that the Dalai Lama makes to territory inside China. We view him primarily as a religious leader. So again this is something that previous presidents have done and President Obama is committed to doing. Recently I discovered that I was wrong all my life in thinking we recognized Tibet as an independent country. It seems we never did. Now I am shocked to find that neither have we ever recognized Taiwan as independent. While in London and Gay Paris, Secretary Clinton sat with NPR’s Renée Montagne and Bloomberg Radio’s Indira Lakshmanan for interviews. Here are the transcripts. SECRETARY CLINTON: Military action is not enough alone. It has to be mixed with political and development work. And I think everyone has realized, as we did in Iraq, that you have to begin to go right at the insurgents and peel those off who are willing to renounce violence, renounce al-Qaida, agree to live by the laws and constitution of Afghanistan and re-enter society. QUESTION: Although — obviously, Afghanistan is not Iraq. And I think there might be those who are hearing this this week, Americans, knowing that American fighting forces are in Afghanistan putting up and just beginning a surge for a big fight with the Taliban. And it would be a surprise and maybe even disturbing to hear that there’s now talk of talking to the Taliban. 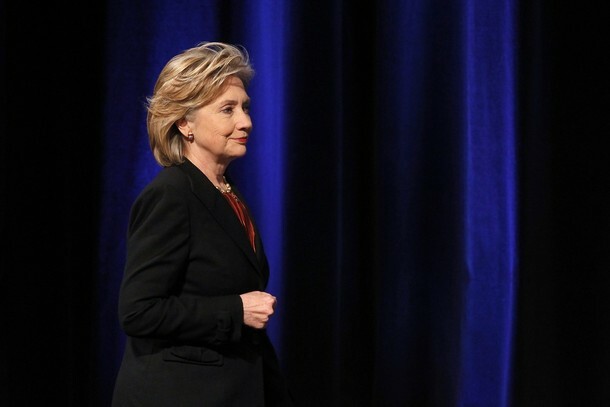 SECRETARY CLINTON: You can’t have one without the other. Only a surge of military forces alone without any effort on the political side is not likely to succeed. Only an effort to try to make peace with your enemies without the strength to back it up is not going to succeed.So, in fact, this is a combined strategy that makes a great deal of sense. Now, I think underlying your question is the concern of people who say well, wait a minute, those are the bad guys. Why are we talking to them? We’re not going to talk to the really bad guys because the really bad guys are not ever going to renounce al-Qaida, renounce violence, and agree to re-enter society. That is not going to happen to Mullah Omar and the like. But there are so many fighters in the Taliban who are there because, frankly, it’s a way of making a living in a very poor country where the Taliban pay them a lot more than they can make as a farmer or in some other line of work out in the countryside. So we’re already seeing people coming off the battlefield. There was a big story in one of the papers today about the military working with a whole tribe in effect to give them an alternative to either being on the sidelines or siding with the Taliban. QUESTION: It’s interesting you mention the article that’s in The New York Times. The tribe is the largest Pashtun tribe in Afghanistan, something like 400,000 members. And basically, what they said was we are going — the tribe has pledged, all its leaders have pledged, to fight the Taliban, for as big as it is, quite a first. The money that came from the American commanders went directly to the tribe, bypassed the government. How do you work out in a sense the tension between going directly to the people who are trying to do something, the tribal groups such as they are in Afghanistan, and also trying to support a government? In this case, the tribal group said they didn’t trust the government to help them. SECRETARY CLINTON : Well, there are two interconnected approaches. The story you’re describing was a story of our American military making this decision similarly to what they had done in Iraq where individuals were given incentives to leave the battlefield — tribal elders, villages. The second aspect of this is what’s called the reintegration fund that will be set up and funded by international donors. A number of countries have made some significant contribution commitments.. And I think that’s smart because this has to be agile and flexible and fluid depending upon the circumstances. QUESTION: Secretary Clinton, you were the first Secretary of State, and I think I’m right on this, who has put a big focus on women’s rights. When you look ahead to integrating the Taliban, even those who have renounced violence, which of course they would have to do for that to happen, back into society and into some sort of political empowerment, are you worried about the effect that this might have — the negative effect this might have on Afghan women? QUESTION: And are they worried about it? SECRETARY CLINTON: They are. They’re worried because they don’t know quite what it means and I think that’s fair. I don’t think there is cause for alarm that the current government or any foreseeable government will turn the clock back like that so long as there is enough power in the state and through the new Afghan security forces to make sure that there is never a resurgence of the Taliban that could come close to taking over large parts of the country. That’s what we’re preventing. I don’t want us to be so diverted into our military and security efforts or the political peace efforts that we forget this country still needs a lot of development, and the only way, in my opinion, that Afghanistan has a chance to develop is if women are given the opportunity to participate fully. QUESTION: President Karzai said this week that he expects Western troops to be in Afghanistan for at least another decade. Is that a timeline that makes sense to you? 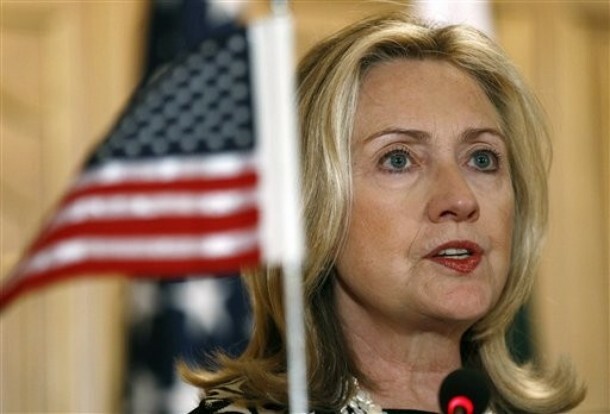 SECRETARY CLINTON: Well, I don’t believe that most Western troops will be in a combat role, but there are in many countries Western troops who do training of national armies or police. There are Western troops that provide intelligence, logistics, et cetera. But it won’t be as it is today where we are putting in thousands more troops — 30,000 from our own country, 9,000 from other countries. That’s not going to be there for 10 years. But I would imagine there will be continuing military assistance and liaison, which is common around the world. QUESTION: Could you give me — what would be an example of talking to let’s say a mid level Taliban? I mean, will American officials sit down with Taliban? Would they work through — what is the practicalities of that? 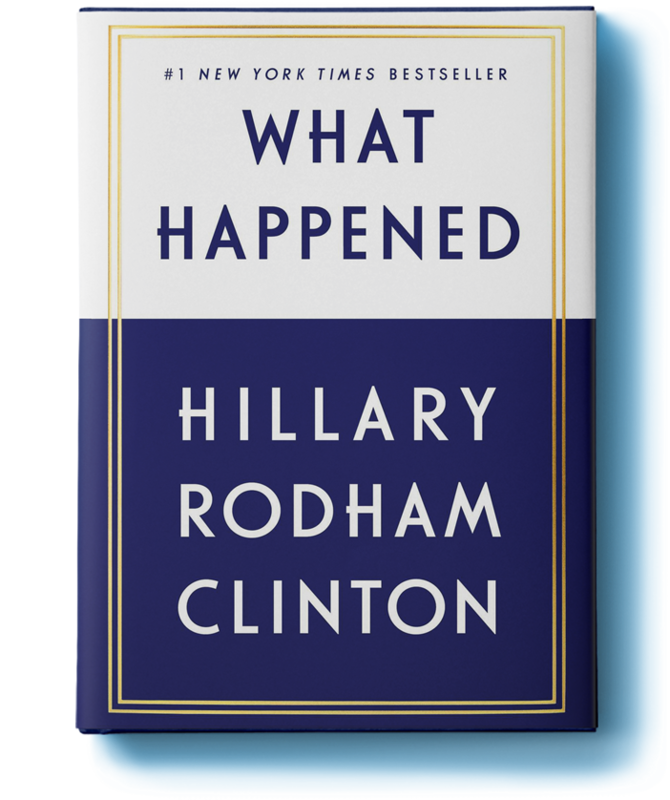 SECRETARY CLINTON: Well, Renee, I don’t know that I can answer that because I think that this is a very new effort. It’s a case-by-case effort. There already have been Taliban who have left and I think it is, for me, just the beginning. And how it goes will be a little bit like jazz. I mean, we’re not sure; we can’t lay it out completely. But there are a lot of so-called members of the Taliban who want out. QUESTION: And of course, Western troops in a way want to get out of Afghanistan. Is this an exit strategy? SECRETARY CLINTON: It’s not an exit strategy; it is part of our comprehensive strategy. You have to have a very tough-minded attitude about this. This is not sweetness and light. You’re dealing with a very difficult, complex phenomenon. A lot of things are moving in the right direction. But most wars, most conflicts these days, don’t end with a victory on the battlefield. So you’ve got to go at it in different ways. We found how to do it in Iraq. We’ve got some of the same people that worked on this in Iraq working with General McChrystal in Afghanistan, and I think we’re headed in the right direction. QUESTION: Secretary Clinton, thank you very much. 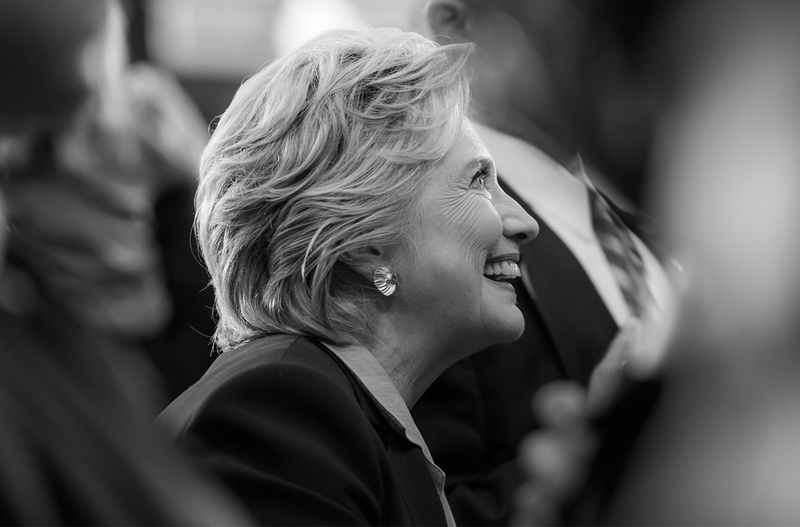 SECRETARY CLINTON: Thank you. Good to talk to you. 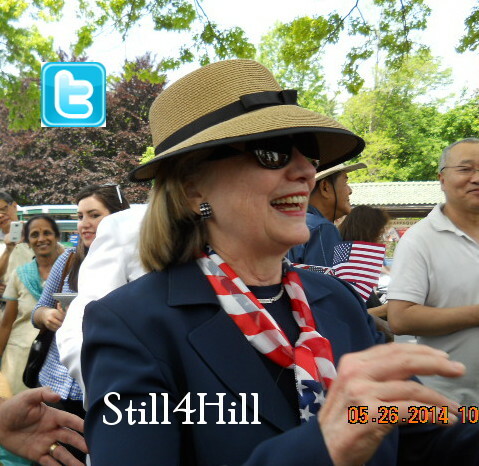 QUESTION: Secretary Clinton, thank you so much for taking the time to speak with us. Last week, you gave a major speech on internet freedom and security and you called on American technology companies to take a stand by refusing to participate in the censorship of cyberspace. Given that China, which is the world’s biggest internet market by users, imposes censorship by law, are you suggesting that companies like Microsoft and Yahoo! should just pull out of that market? SECRETARY CLINTON: Well, what I said in the speech is that I thought it should be carefully evaluated with respect to the businesses that operate in any setting where either censorship or interference with their businesses occur. Obviously, these are decisions that individual businesses have to make for themselves. But it is important to point out that we cannot afford in today’s interconnected world to have too many instances where businesses are constrained, where information is not flowing freely, where companies’ accounts can be hacked into. So this may be just the beginning of what will be a vigorous discussion globally about how to deal with these challenges. QUESTION: All right. Now, the other day, Microsoft chairman Bill Gates seemed to almost contradict your message from your speech. I was wondering if he had heard your speech, because he said that China’s internet censorship was actually very limited. And you and the U.S. Government have repeatedly expressed concerns about China’s monitoring of human rights activists and even the apparent theft of their personal information allegedly in the Google case. Is Gates somehow missing the bigger picture here beyond profits? SECRETARY CLINTON: Well, I don’t want to second-guess or in any way assess from a distance what Bill Gates meant. But I do think it’s important to recognize that my speech and Google’s complaints were not restricted to what we think of as censorship – in other words, information not being available through the internet or not being transmitted by the internet. It was, as you say, a broader concern about the actual interference that was alleged against users of email, and that raised a second set of serious questions. So I think, as I said, we want to get everybody’s opinion on this. We want to begin to discuss it. That was one of the reasons for my speech, because I think we’re entering into a time period where what happens in cyber space is going to be increasingly important to not only national security, but commercial interests, personal privacy. And I don’t think we yet know how to handle this. QUESTION: Now, would export controls play any role in this? Is the U.S. Government thinking about export controls on internet technology or programs that help hackers inadvertently? SECRETARY CLINTON: Well, this is an area that we are looking at very closely because there are some quite legitimate questions about our export control regime. It goes from the absolutely ridiculous of preventing the export of bolts and nuts and screws for certain military equipment that have no military purpose in and of themselves to questions that are legitimate about encryption technology. So you may know that the Administration has launched a review of export control laws and regulations. The State Department, Defense Department, Commerce Department are leading this effort. So we’re going to be exploring how do we streamline and improve our export control authorities and eliminate restrictions on items that are not militarily or otherwise harmful, but not cast such a wide net as we do today. QUESTION: All right. One last question on this: The Chinese Government has insisted that it has nothing to do with the hacking. Has Google shared any evidence with the U.S. authorities that proves China was involved in hacking either its accounts or that of more than 20 other U.S. companies? And if so, what can the U.S. Government do if China simply refuses to investigate? SECRETARY CLINTON: Well, Indira, I think this is one of those unexplored areas that we wouldn’t have even been talking about five or 10 years ago. We called for a transparent examination of what did happen. The response back is that there wasn’t any official action. I can’t sit here today and judge that. I think there’s some uncertainty about who did what. But my larger point is that it’s in everyone’s interests to begin to try to hammer out some rules of the road. As I said at the speech earlier this afternoon at L’Ecole Militaire, we today have a company that’s a U.S. company making these claims about what happened to them. In five or 10 years, it could be a Chinese company or a Russian company or an Indian company. So just because we’re concerned, understandably so, that it was an American company doesn’t mean that others shouldn’t be concerned about what might come down the road affecting their own company. So it’s like when air travel started so many decades ago. Finally, people got around to having international rules so that you wouldn’t have airplanes running into each other in the sky. There’s just a growing awareness that the control and the regulation of cyber space so that we keep the internet as free and open as possible is really in everybody’s interest. QUESTION: There have been widespread reports that in cases involving Russia where there was hacking, that some of the hacking actually involved mafia elements who might have been doing it in collusion with the government. So that’s one of the theories that’s being explored in the China case. I don’t know if that’s something that law enforcement has discussed with the State Department, the notion of Chinese mafia involvement and the sort of, you know, unseen hand of the Chinese Government in that case. SECRETARY CLINTON: Well, we are, as you probably know, taking cyber security very seriously. The President has appointed a cyber security director. We are reorganizing within the State Department to be on top of this issue and begin thinking through all the different legal and regulatory, diplomatic, and commercial implications. So I don’t want to characterize any past incident because as of this time, we have a number of suspicions or anecdotes or concerns, but at the end of the day, what I’m really interested in is making sure that we try to have some international agreement on how we will protect information flow and how we will join together to punish wrongdoers. I mean, it could be a government today, an al-Qaida tomorrow, and – or another terrorist group that is local to a certain country. So everybody needs to start taking this seriously. That’s my overriding message. QUESTION: All right. You’ve just come from a conference on Afghanistan at which Afghan President Hamid Karzai spoke about convening a loya jirga and inviting insurgents. What is the U.S. position on this? Because U.S. officials have told us that there is a distinction between reintegration and reconciliation, and that the U.S. isn’t about to make peace with Taliban leadership. So tell me how you see President Karzai’s plan. 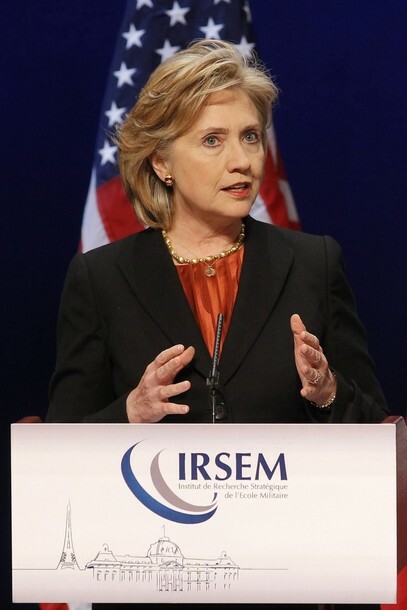 SECRETARY CLINTON: Well, there is a distinction between reintegration and reconciliation. Reintegration refers to, just for the basis of this conversation, the foot soldiers, the folks on the battlefield who want to get off of it, who want to return to their village and resume a normal life. That literally is happening all the time. The problem has been there’s not been an organized effort to provide protection and income substitution for the fighter who surrendered to a NATO ISAF commander and who then nobody knew what to do with. And in fact, over the last several years, Taliban have tried to come off the battlefield, they’ve been – they’ve surrendered, they’ve been accepted, they’ve been sent home, they’ve been – had promises made to them which haven’t necessarily always been fulfilled. And I think there’s a strong conviction on the part of our military commanders that there’s a real opportunity to accelerate the movement of Taliban soldiers away from the Taliban. Reconciliation talks more about the political process where leaders would make peace. We see – you don’t make peace with your friends when you have a conflict. Leadership has to decide to resolve it. We see that all over the world. And so President Karzai is putting together some standards and descriptions of what that will mean, and we’re obviously very interested about how that comes out and have made clear that we want to protect the interests of the ordinary person. We want to honor the memory of not only our American soldiers, but the soldiers from every country, the soldiers of Afghanistan, others who have made a sacrifice. And I particularly am concerned about not doing anything that turns the clock back on Afghan girls and women. So there are many aspects to this, but there always are. I mean, trying to resolve conflict is difficult, it requires a lot of patience, but the international community, including the United States, supports the objectives, but obviously, the details matter. QUESTION: Now, one of those details is that the outgoing UN envoy in Afghanistan, Kai Eide, recently met with the Taliban leadership in, you know, a meeting that was kept quiet at the time. Is that something that you would consider a U.S. official participating in, something similar to that, to feel out what the Taliban leadership is thinking? SECRETARY CLINTON: Indira, I don’t think it’s useful to speculate about what might or might not be done because so much of it depends upon assessments that can’t really be made from afar. Our military commanders are very committed to this process, growing out of their own experience in Iraq. They believe that the work they did in Iraq, which was both American military and civilian leadership led, helps to ensure the success of the surge. And it was kept quiet, it was done very thoughtfully, so I think it’s probably wiser not to be speculating about what we will or won’t do. Obviously, our goal is to stabilize Afghanistan, transition security to the Afghan forces, and bring our troops home while we maintain an ongoing civilian diplomatic relationship with Afghanistan into the future. QUESTION: Last question on Iran. All week, you’ve been pushing with partners and allies on a new sanctions possibility. I want to know – you made a very strong statement today about China needing to think about its long-term interests beyond the fact that Iran is the third biggest supplier of China’s crude oil. So tell me, what assurances have you gotten that now when France takes the leadership of the Security Council that you are going to go forward with sanctions? And related to that, what are your thoughts on the Senate having passed this new sanctions bill in Congress? SECRETARY CLINTON: Well, first, it’s not a surprise to anyone that we’ve been working to gain support for pressure and sanctions along with other partners for a while now. Once it became clear that Iran was not going to be responding satisfactorily to our general offer of engagement or our specific offer regarding the Tehran research reactor, work began to try to shape the sanctions, design them so that they could be effective, talk about enforcement, and listen to the concerns of other nations. That process is going on. There will be a concerted effort. Again, I’m not going to preview when, what, or how because I think that’s not productive. But it’s been reported widely that China has questions. They themselves have said that on various occasions. But up until now, they have been totally united with the P-5+1. And the arguments we have put forth to them are very clear that we think this is in the interest of international peace and stability to prevent Iran from moving forward with a nuclear weapons program, and that it’s in the interest of the nations discussing it, including China. QUESTION: And on the Senate passing that bill through Congress, that second part? SECRETARY CLINTON: Well, that’s not a surprise. I mean, the Senate is very concerned about Iranian behavior, and with good reason. It’s not only the nuclear program, as distressing as that is, but these recent activities where they basically are executing demonstrators and claiming that anybody who protests against the Iranian Government is in a war against God are extremely troubling. So the Congress – I’ve served in Congress, I know – wants to express strongly its disapproval of Iranian behavior, its support for human rights, and its belief that putting pressure on Iran can help change the regime and actually put international pressure to support the dissidents. QUESTION: Madam Secretary, thank you so much for speaking with Bloomberg Radio today. SECRETARY CLINTON: It’s a pleasure talking with you. Thank you. It is such a treat for me to be here and to have this opportunity to say thank you, first and foremost to our ambassador, who is doing such a wonderful job. It’s a real pleasure to serve with you, Charles, and with you, Susan, and with your children, because it’s a family commitment which we appreciate greatly, and to know that our mission here in Paris and throughout France is in such good hands. Also to Ambassador Kornbluh and her son, we are delighted you are here, and I thank Karen so much for the work that she is doing at OECD, which is an international instrument that needs to be used even more. And I look forward to working with you. And to David Killion and to Kristen and everybody at UNESCO, thank you for helping us reenter UNESCO, set the right tone, and work on many of the important issues that matter to our country. As Ambassador Rivkin said, it is a great honor to serve the United States anywhere in the word, and I see that wherever I travel. But it is special to come to France and to thank everyone here for the work you do every single day. This is our oldest mission, our oldest ally, and as I said at a speech earlier this afternoon, a partner in so much, including our own independence, and the liberation of Paris. There is a great, rich history, but relations are not about the past; they’re about the future. And I think that we will see even closer cooperation between the United States and France in the years ahead. I bring you warm greetings from President Obama, who is also very grateful for your service. I want to thank your deputy chief of mission, Mark Pekala, who I know from previous incarnations, and to all of you who are in the Foreign Service and the Civil Service. You have helped us really turn the page on the past in our relations with France. We’re creating a level of trust and confidence, which I certainly saw exhibited in my meetings earlier with the National Security Advisor Levitte, and, of course, with President Sarkozy. And I’m on my way to be with the foreign minister for a meeting and a dinner. But to me, what is most important is that you’re not just doing what is expected. You’re really creating new expectations and going beyond boundaries. I wanted to acknowledge Ambassador Rivkin’s greening initiative here at post, which highlights the importance of individual efforts to address climate change, and his ideas to launch a green trade mission conference that would draw international business leaders together to share greener business practices or to build a carbon-neutral Marine house. This will trigger the kind of conversations and cooperation that we are seeking with our host country. And it’s a shared interest, it’s a common concern, and we want to take concerted action. I also want to acknowledge Ambassador Killion’s work with the new UNESCO Director-General Bokova, whom I met with last week. I was proud to offer our support for the organization’s comprehensive agenda, not only encouraging freedom of expression and promoting advances in science and engineering, but concentrating on women and girls around the world, particularly their education, something which is key to America’s efforts to stabilize countries, to resolve conflicts, to raise the aspirations and incomes of societies. And I look forward to working with David. And I want to acknowledge Ambassador Kornbluh’s leadership and Mission OECD’s role in helping to advance progress on the global economic recovery, something that is not only of the moment but must be sustained. We have to continue to work with our European friends to promote common interest in bank reform and efficient energy policies, free markets, stronger mechanisms to counter corruption, an issue that is very timely. I know that a number of you have gone above and beyond the call of duty. 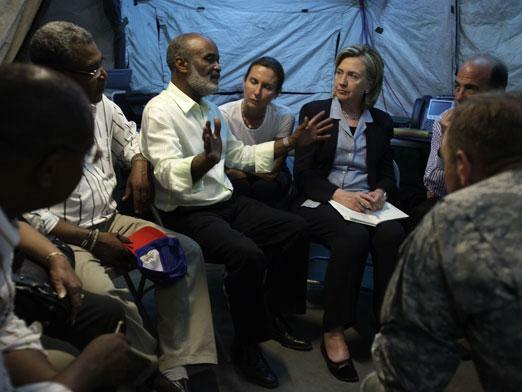 I want to thank the four Embassy personnel who volunteered to assist with Haitian earthquake relief. I want to thank the five Embassy employees who are currently deployed to hardship posts, and they’re not with their families, and so I want to thank them through you. So please pass my gratitude on. And I want to acknowledge and thank the 19 Embassy employees who recently returned from hardship posts. We know that we have responsibilities in every corner of the world and we know we’ve got the best people to carry out those responsibilities, but we also recognize the stress that comes with many of the jobs we expect you to perform. So it’s nice to see that you are enjoying some time in one of our most important posts in the world. I am also very conscious of what a visit like mine means. Everything I just said about the work you do every day is certainly not even close to describing what you then have to do on top of that to prepare for a visit like this. But it’s very important that we constantly nurture our relationship not only with the French Government but with the French people. And I’m deputizing you all to be sure that you do that, so that we not only have good ties that are even stronger now but we constantly lay the groundwork for whatever happens and however we have to work together. 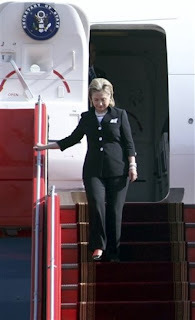 But there is a tradition of the “wheels up” party, which is well-deserved, when people have labored and tried to figure out how to manage all the moving parts of a visit by a Secretary of State. And you might want to wait for better weather, but I highly urge the ambassador to consider that. The challenges that we are confronting are so cross-cutting; they really don’t respect boundaries. So we couldn’t address them without our partner nation states, and particularly here in Europe, who have common values and common interests, want to work toward a common future. And it is exciting to see the progress in our relationship on a range of matters that we are now deeply involved in discussing with the French Government. But it’s not just about the crisis du jour and what’s on the front page of the paper or at the head of the news. It’s also about – let’s take a step back, look over the horizon. What do we need to do to be ready for the future? It was American and European leaders who really created the architecture for the world that we inhabit today. That architecture stood the test of the time, but it’s no longer adequate to the challenges we face. So how do we prepare ourselves? What do we need to do differently? How do we image that future that we want to help create? And it’s especially important for that baby back there – (laughter) – because everything we do is about his or her future; I have no idea which. And I want to end with a story. It’s not about France. It’s about our dialogue with China, because we have many issues, some of them (inaudible) when it comes to dealing with the Chinese leadership. But we started a comprehensive Strategic and Economic Dialogue that Secretary Geithner and I chair. And at the first meeting, there was – we had a dinner the night before, and the top Chinese officials were there and the person who is my counterpart in the dialogue is State Councilor Dai Bingguo. And he was sitting at the table, and we started talking about what we were doing. And he told me he had just had his first grandchild. I said, you know, I think that we ought to ask people when they come to international meetings to bring pictures of children and grandchildren or nieces or nephews or other children who are precious and important to them, and put those pictures out on the table and think through, is the decision that you’re about to make going to make their lives better? And the next time we had a meeting in Beijing during the President’s trip to Beijing, the first thing he did when he sat down was take out a picture of his grandchild. I have been involved in child advocacy my entire adult life, and I do try to think about what’s in the best interests of children, how do we best serve them? I got to meet two of the ambassadors’ children today, of Ambassador Rivkin and Ambassador Kornbluh, and it just brought home once more this work is very important. And we really applaud and thank you for being willing to be in public service and to do what you can to make a difference for that future. There does not appear to be a video available. If I do find one, I’ll add it. SECRETARY CLINTON: Well, thank you very much, and it is a personal pleasure for me to be here in Paris and to have the opportunity to meet with Bernard, who has become not just a valuable partner but a trusted friend. We have worked closely together during this past year. In fact, I think the foreign minister was one of the very first visitors that I had at the State Department. I always know that I can pick up the phone; we can consult as frequently as we need to, and it’s often because of the array of issues that we’re confronting. In addition to what the foreign minister said, we also discussed the results of the London meetings on Yemen and Afghanistan. We have a lot of work ahead of us. We appreciate greatly the support that France has given in developing a European police force mission to support NATO in its effort to train police. There was an enormous amount of concern, as you might guess, about the way forward on the issues that Bernard has mentioned, but we have tried to work carefully and seriously toward the kind of approach of working agendas that make a difference. With respect to Haiti, we so appreciate the work that France is doing, and both President Obama and I particularly appreciated President Sarkozy’s kind words about the United States’ efforts in Haiti. And like so much of the rest of the world and certainly among my colleagues, we look to Foreign Minister Kouchner because of his experience as a humanitarian. He’s now a diplomat with a doctor’s compassion and a humanitarian with a statesman’s vision. And so we ask him often, well, what would you do and how would it work? And he brings not only a passionate commitment, but a practical understanding of the difficulties that we’re facing as we attempt to try to help the people of Haiti. We will be consulting even more closely. 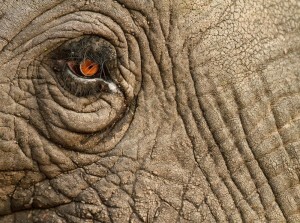 Our work in Africa is particularly important. I applaud France for resuming diplomatic relations with Rwanda, and I also appreciate greatly the work that Bernard and the government here is doing in Guinea and in other African countries. On a personal note, it was very meaningful in the immediate aftermath of the Haitian earthquake to see French and American search-and-rescue teams working furiously to find survivors at the Hotel Montana. So many were lost there, including a number of young Americans who were on a university mission trip to Haiti. On the second night after the quake, French rescuers freed seven American citizens from the rubble. And as the evening wore on, an American team from Virginia found another survivor, who happened to be French, who was scared but thankfully alive. The father of an American student who died at the Montana called these international search-and-rescue workers “angels on earth” after coming down to see for himself where his daughter died on her birthday. We’ve seen wonderful work because the international community came together. As the Haitian people persevere through this calamity, they are demonstrating resilience, ingenuity, and resolve. And we need to match that. So Bernard and I are very committed personally as well as on behalf of our presidents and our governments. This will not be, by any means, a perfect endeavor. 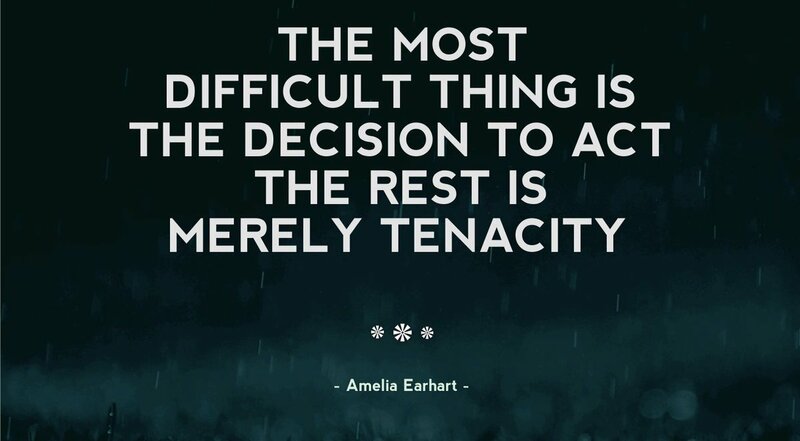 The challenges are enormous. But I think we will pledge our best efforts to cut through the bureaucracy to create the circumstances that will enable Haiti to have a better chance for the future. And I look forward once again to working with you. FOREIGN MINISTER KOUCHNER: Sorry. Yes, Tom. QUESTION: Tom Junod with Esquire magazine in the States. Mr. Foreign Minister, in her speech today, Secretary Clinton spoke of the need for better coordination on relief efforts in the face of natural disasters. As co-founder of MSF, how do you think that the relief efforts in the case of Haiti could have been better coordinated? And has there been any discussion of a coordinated response to relieve some of the misery of the Haitian refugee camps by admitting some of the refugees to either France or the United States? And if not, why not? Madam Secretary, the second part of the question: All week long, I’ve seen you try to muster an international response to the question of Iran sanctions. Last night, the Senate passed an Iran sanctions bill that gives you, the Administration, power to start proceeding unilaterally in some ways. Can you comment on that? FOREIGN MINISTER KOUCHNER: Well, yes, of course, we are always dreaming to a better access to the victims, to a sort of faster intervention. But it is always, unfortunately, the case in natural disaster this is impossible because it has not been prepared because, of course, it was not able to prepare. We are coordinating as much as possible, I mean, in the European terms, altogether the 27 nation. We are and we were facing such kind of drama. But believe me, it was the, let’s say, most tragic natural disaster I ever met in terms of victims and destruction. Port-au-Prince has been completely devastated. So was it possible? Yes, it was possible. But unfortunately, we are always looking to the criticism and not to this huge international efforts – very efficient certainly, but not in the good moment, because to be efficient in an earthquake it should have been possible, but not impossible, but were impossible to imagine to be at this good moment, that is to say in the first hour, impossible. So we sent teams altogether the first day, Wednesday, then Tuesday. But after some two, three, four days, yesterday – another time, after 15 days – was rescued one little girl of 16. But this is a miracle. So yes, I do regret that we were unable to coordinate, but it was impossible to coordinate. First, it is impossible to coordinate the NGOs. Impossible. We have to give them the opportunity of being complementary together. Second, is it possible to coordinate at the level of nations, all the nations – South American, North American, the Americas? My dear, sorry, but we did our best, honestly. And I don’t want to tell you that next catastrophe we’ll be better prepared, but this is unfortunately always the case, always the case. This is – I’m so sorry for the victims because the number of the victims, this is a mountain of victims we had – we are supposed to rescue. We did our best. We were efficient. The Americans – and I really thank our American friends because they were close. So by thousand of them they came. And you know there is always some misunderstanding, always; the minimum was there too, as in misunderstanding. But the efficiency and the devotion to the people, I mean, we did our best. Sorry. SECRETARY CLINTON: Well, I agree. And I think that as we move forward in our work in Haiti, we will have the time to better think through how to deal with the devastation that the earthquake caused, which is something that Bernard and I are committed to doing. And perhaps we can also, as I said in my speech, think through how to divide some responsibilities internationally. It is important to try to mitigate disasters. One of the things I hope we’re able to do in Haiti is to help them build back in a stronger way. The American Embassy was not harmed because it was built to withstand earthquakes. It’s like what we learned after the San Francisco earthquake in the early ‘90s. A lot of buildings fell that were rebuilt stronger, so next time we hope they don’t fall. But in Haiti, it was that cement concrete construction and it just collapsed. So there are lessons to be learned, and we will learn and try to do better as we go forward. On Iran, the Congress is very concerned about Iranian behavior, both with respect to its nuclear program and its abuse and repression of its own people. We are working with the Congress because we understand their deep concern and we are going to do what we can to try to direct their legislation in a way that supplements our efforts internationally. But I have said all along that we’re going to work as hard as we can to get the strongest possible resolution out of the Security Council. Then countries that feel strongly, like France and the United States feel, may wish to do more. So this is not in any way contradictory to our international efforts. If anything, it may well be complementary. QUESTION: Is there any chance of the door opening to any Haitian refugees in either country? 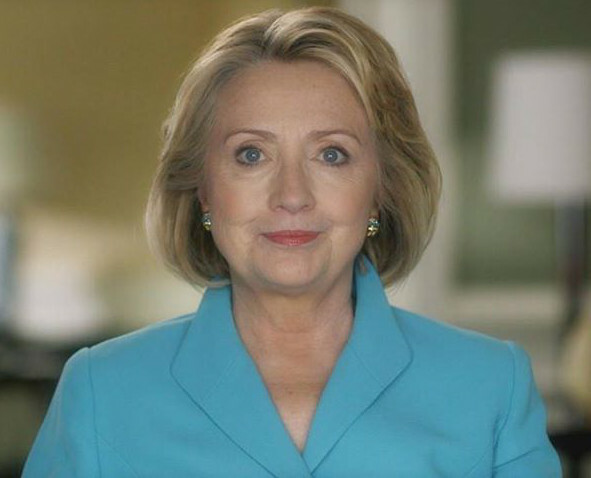 SECRETARY CLINTON: Well, certainly speaking for the United States, we have opened the doors to children awaiting adoption who did not have the papers to get in yet. We have opened the door to people needing medical treatment. And we have provided protection for Haitians who are in the United States without legal papers. We will continue to look at this. I know that a number of commentators have said that countries that can should try to relieve the burden on the Haitian people by trying to reunite families and take some other steps. We will look at all of that. But obviously, we have not made any decisions. FOREIGN MINISTER KOUCHNER: The same thing for us. We opened the door to the orphans and receive their legal documents, but of course (inaudible) would be also welcome to step up (inaudible). QUESTION: Hello, Mrs. Secretary. I’m – my name is Natalie Nougayrede. I work for Le Monde. France is the only big European country that in the run-up the London conference on Afghanistan did not announce an increase in its level of military – its military figures on the ground. Are you slightly disappointed with that, and does that reflect a possible discrepancy in the way France sees the pertinence or the need for a surge in Afghanistan at this point? FOREIGN MINISTER KOUCHNER: First (inaudible), it’s up to you. 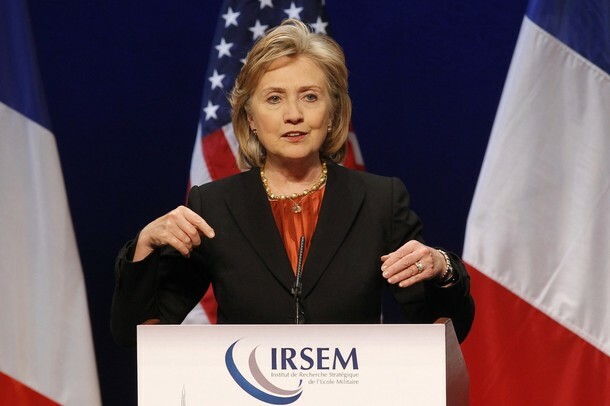 SECRETARY CLINTON: First let me start by saying how much we appreciate the French contribution in Afghanistan. French soldiers have been courageous. They have partnered with the United States and others on the battlefield. I don’t need to remind a French audience that some have paid the ultimate price and lost their lives or have been grievously injured. So I start by expressing the deep appreciation that the United States feels for the service of our French counterparts on the battlefield and commend the young men and women who serve your country. Secondly, we are very grateful for the civilian support that France has provided to Afghanistan. There are many examples of it; one will suffice. The hospital that France built in Kabul has become a remarkable center not only for treating patients but training Afghan doctors and nurses. And France does so much else. We are very confident that the work that France has done and the commitment that France has made is extremely valuable and supportive of our overall international efforts. Now, only France can make a decision as to what is appropriate in terms of the contribution. There are certainly discussions about police training, the kinds of things that France is particularly good at which are ongoing. But I expressed the same appreciation to President Sarkozy. I think that we are grateful for the decision that France made last year to rejoin the integrated command in NATO. So they are fully involved in what we are attempting to do in Afghanistan and we are appreciative of those commitments. 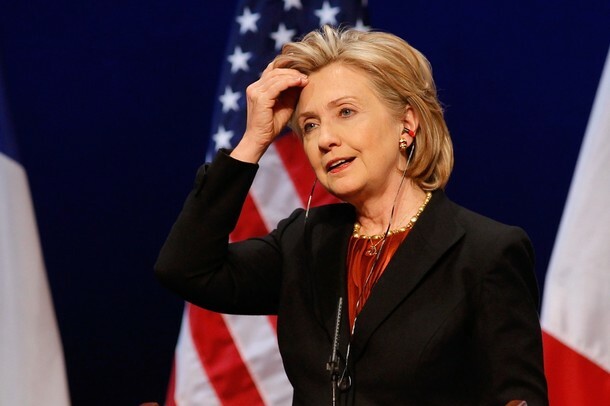 QUESTION: Secretary Clinton, one question if I may, please. Thank you. Thank you so much. Thank you for taking this question. I know that you’ve had a really long day and I’m sure you want to hit the sack probably. In your speech today, you mentioned Iran, you mentioned Afghanistan, you mentioned terrorism. Do you think that all of these problems would be much, much easier to deal with if a permanent solution could be found for the crisis in the Middle East? That’s the easy one. And the more difficult one is: Do you think that Israel is now so powerfully politically, so well funded, that it can actually afford to ignore you, President Obama, President Sarkozy, Foreign Minister Kouchner, and completely go its own way? And if that is the case, at what point do you think sanctions should be raised against Israel? SECRETARY CLINTON: Well, let me start by saying that we had a very thorough discussion of the Middle East. We are committed to a two-state solution, Israel having the security it deserves to have as a democracy in the Middle East and the Palestinians have the state they deserve that will provide opportunity and peace and prosperity for them. That is the commitment that we are working toward and it is a commitment that has been endorsed by not just the Palestinians but the Israelis as well. These are difficult issues to resolve. Obviously, everyone knows that. But we are going to not only redouble our efforts in working with the parties, but try to make it clear to everyone that that is the answer that we all have to be committed to. So I don’t think it is useful to talk about any other actions because our goal now is to re-launch negotiation and reach settlement on the issues that are outstanding between the Israelis and the Palestinians. We are committed to it. Unfortunately, there are other voices that are not committed that are often quite loud and even provocative, but the fact is that patient diplomacy is what is called for. And so that is what we are pursuing and we are, as President Obama has said, committed to following through every day after, frankly, a period where the United States was not as engaged as we would have liked. We have changed that policy. FOREIGN MINISTER KOUCHNER: Thank you very much. 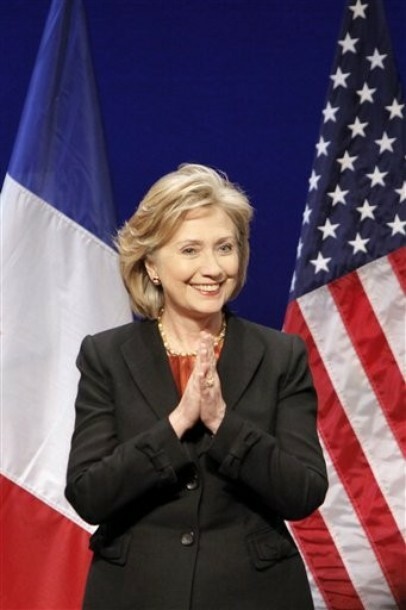 SECRETARY CLINTON: Thank you very much, Mr. Charillon. And it is a great pleasure to be here at this historic setting, and I appreciate the opportunity to discuss a matter of great consequence to the United States, France, and every country on this continent and far beyond the borders: the future of European security. Now, this is not only here at L’Ecole Militaire an architectural and historical treasure, one that when I was much younger I would walk by and looked at as I wandered the neighborhoods. But this is also a place that speaks to the long and proud partnership between the French and American militaries on behalf of our mutual defense and freedom. Two hundred and fifty years ago, young men from across France began arriving here to be trained as soldiers and officers of the French military. And only a few years later, you stood with us during our war of independence. Soldiers from both nations fought together to liberate Paris 65 years ago. Today, they fight together in Afghanistan to defeat al-Qaida and the syndicate of terrorists and offer the Afghan people the hope of a stable future. As founding members of the NATO Alliance, our countries have worked side by side for decades to build a strong and secure Europe and to defend and promote democracy, human rights, and the rule of law. And I am delighted that we are working even more closely now that France is fully participating in NATO’s integrated command structure. I thank President Sarkozy for his leadership and look forward to benefiting from the counsel of our French colleagues as together we chart NATO’s future. Today, thanks to the partnership between our nation and others, Europe is stronger than ever. The bitter divides of the Cold War have been replaced by unity, partnership, and peace. Russia is no longer our adversary but often a partner on key global issues. Nations that once were members of the Warsaw Pact and eyed NATO with suspicion are now active members of our Alliance. And the European Union has grown to include 27 nations, from the British Isles to the Baltic states, and is poised to become even more dynamic with the ratification of the Treaty of Lisbon. As I recently expressed to the new EU High Representative Baroness Catherine Ashton, the challenges we face in our Euro-Atlantic relationship demand collective responses, and the European Union is an invaluable and increasingly effective force for global progress. So the accomplishments of the past half century have showcased how vital European security is, not only to the individual nations, but to the world. It is, after all, more than a collection of countries linked by history and geography. It is a model for the transformative power of reconciliation, cooperation, and community. But at the same time, much important work remains unfinished. The transition to democracy is incomplete in parts of Europe and Eurasia. Arms control regimes that once served us well are now fraying. And in too many places, economic opportunity is still too narrow and shallow. Adding to these ongoing challenges, the institutions that guarded Europe’s and North America’s security during the 20th century were not designed with 21st century threats in mind. New dangers have emerged, such as global terrorism, including cyber terrorism and nuclear terrorism; climate change; global criminal networks that traffic in weapons, drugs, and people; threats to Europe’s energy supply, which, if exploited, could destabilize economies and stoke regional and even global conflict. Tanks, bombers, and missiles are necessary but no longer sufficient to keep our people safe. Our arsenal must also include tools that protect cyber and energy networks, halt the proliferation of weapons of mass destruction, counter the threats of terrorism and destructive ideologies, in part by confronting the political, economic, and social conditions that give rise to such ideologies in the first place. The transatlantic partnership has been both a cornerstone of global security and a powerful force for global progress. Now we are called to address some of the great challenges in human history. And to meet them, we are required to modernize and strengthen our partnership. New thinking is underway on both sides of the Atlantic. NATO is revising its Strategic Concept to prepare for the alliance’s summit at the end of this year here at (inaudible). I know there’s a lot of thinking going on about strategic threats and how to meet them. Next week, at the Munich Security Conference, leaders from across the continent will address urgent security and foreign policy challenges. France has urged all of us for a high-level discussion to address European security. Other nations have proposed new approaches and agreements. Russia has recently suggested both a new European security treaty and a new NATO-Russia treaty. The United States, too, has also been studying ways to strengthen European security and, therefore our own security, and to extend it to foster security on a global scale. Today, I’d like to discuss the core principles that guide the United States today as we consider the future of European security and our role in shaping, strengthening, and sustaining it. But first, let me address some questions raised in recent months about the depth of the United States commitment to European security. Some wonder whether we understand the urgent need to improve security in Europe. Others have voiced concern that the Obama Administration is so focused on foreign policy challenges elsewhere in the world that Europe has receded in our list of priorities. Well, in fact, European security remains an anchor of U.S. foreign and security policy. A strong Europe is critical to our security and our prosperity. Much of what we hope to accomplish globally depends on working together with Europe. And so we are working with European allies and partners to help bring stability to Afghanistan and try to take on the dangers posed by Iran’s nuclear ambition. We are working with Europe to help meet the crisis of climate change and revitalize the global economy. And we’re working in the fight against extreme poverty, gender-based violence, and pandemic disease. Human rights and universal values, shared as part of our common history between Europe and the United States, must always be a cornerstone of our security efforts, because if Europe is not secure, Europe cannot lead. And we need European leadership in the 21st century. But European security is far more than a strategic interest of my country. It is also an expression of our values. We stand with Europe today, as we have stood with Europe for decades, because enduring bonds connect our nations and our peoples. We are united by an understanding of the importance of liberty and freedom. We have fought and died for each other’s liberty and freedom. These are ties that cannot and never should be broken. And we seek both to venerate and reinforce them by helping to maintain peace and security in Europe, today and all the tomorrows to come. But as we move forward, a set of core principles will guide us in our approach and in our joint effort. First, the cornerstone of security is the sovereignty and territorial integrity of all states. Much of the suffering that occurred in Europe during the 20th century emanated from a failure to respect borders or to honor the right of all nations to pursue their own foreign policies, choose their own allies, and provide for their own self-defense. These are fundamental rights of free nations and must and will remain vigilant in our efforts to oppose any attempt to undermine them. The United States has demonstrated our adherence to this principle in recent years with our support for new European democracies seeking to chart their own political futures, free from external intimidation or aggression. We have repeatedly called on Russia to honor the terms of its ceasefire agreement with Georgia, and we refuse to recognize Russia’s claims of independence for Abkhazia and South Ossetia. More broadly, we object to any spheres of influence claimed in Europe in which one country seeks to control another’s future. Our security depends upon nations being able to choose their own destiny. For years, Russia has expressed a sense of insecurity as NATO and the EU have expanded. But we strongly believe that the enlargement of both has increased security, stability, and prosperity across the continent, and that this, in turn, has actually increased Russia’s security and prosperity. Furthermore, the right of all countries to enter into alliances of their own choosing has been endorsed by Russia and all members of the OSCE at the 1999 Istanbul summit. NATO must and will remain open to any country that aspires to become a member and can meet the requirements of membership. But we do not seek to create divisions between neighbors and partners. Russia’s confidence in its security enhances our own. So that brings us to our second principle: Security in Europe must be indivisible. For too long, the public discourse around Europe’s security has been fixed on geographical and political divides. Some have looked at the continent even now and seen Western and Eastern Europe, old and new Europe, NATO and non-NATO Europe, EU and non-EU Europe. The reality is that there are not many Europes; there is only one Europe. And it is a Europe that includes the United States as its partner. And it is a Europe that includes Russia. For in this century, security cannot be a zero-sum game. The security of all nations is intertwined. And we have a responsibility to work to enhance each other’s security, in part by engaging with others on these new ideas and approaches. Now, the Russian Government under President Medvedev has put forth proposals for new security treaties in Europe. Indivisibility of security is a key feature of those proposals. And that is a goal we share, along with other ideas in the Russian proposals which reaffirm principles of the Helsinki Final Act and the NATO-Russia Founding Act. However, we believe that these common goals are best pursued in the context of existing institutions, such as the OSCE and the NATO-Russia Council, rather than by negotiating new treaties, as Russia has suggested – a very long and cumbersome process. I want to emphasize, though, even though we may have differences with Russia, the United States is very proud of what our two countries have accomplished together during the past year. The Obama Administration inherited a deteriorating relationship with Russia, and we immediately set out to build a more substantive and constructive relationship based mutual respect and mutual interests. Together, we have made progress on a range of such matters, including helping to address Iran’s nuclear program through the P-5+1, sharing a concern about stabilizing Afghanistan, confronting North Korea’s defiance of its international obligations, negotiating a new Strategic Arms Reduction Treaty, tackling non-traditional threats such as pandemic disease, cyber warfare, and the trafficking of children. We will build upon this foundation as we seek to revitalize the NATO-Russia Council, so it can make concrete contributions to areas where we are working together and need to be doing even more, such as in missile defense, counternarcotics, and Afghanistan. And we are committed to exploring ways that NATO and Russia can improve their partnership by better reassuring each other about respective actions and intentions, through greater military transparency, the sharing of information, and other means of building trust and confidence. Now, I don’t need to state, but I will, that the United States and Russia will not always agree. We have different histories, different experiences and perspectives. Our interests will not always overlap. But when we disagree, we will seek constructive ways to manage our differences. Third, we will maintain an unwavering commitment to the pledge enshrined in Article 5 of the NATO treaty that an attack on one is an attack on all. When France and our other NATO allies invoked Article 5 in the aftermath of the attacks of September 11th, 2001, it was a proclamation to the world that our promise to each other was not rhetorical, but real. And the people of Europe brought great comfort to the people of the United States by reminding us that even in such a difficult hour, we were not alone. I was a senator representing the state of New York at that time, and I well remember the extraordinary outpouring of support that the people of New York specifically received. And for that, I thank you. And I assure you and all members of NATO that our commitment to Europe’s defense is equally strong. As proof of that commitment, we will continue to station American troops in Europe, both to deter attacks and respond quickly if any occur. We are working with our allies to ensure that NATO has the plans it needs for responding to new and evolving contingencies. We are engaged in productive discussions with our European allies about building a new missile defense architecture that will defend all of NATO territory against ballistic missile attack. And we are serious about exploring ways to cooperate with Russia to develop missile defenses that enhance the security of all of Europe, including Russia. Fourth, we are committed to practicing transparency in our dealings in Europe, and we call on other nations to do the same. In this interconnected age, and particularly on this integrated continent, a threat that originates in one country can quickly become a regional or even global crisis. To keep Europe safe, we must keep the channels of communication open by being forthright about our policies and approaches. That begins with transparency. The United States supports a more open exchange of military data, including visits to military sites and observation of military activities and exercises because when nations are uncertain about the military capabilities of their neighbors, that uncertainty can foster suspicion and even lead to conflict. As we work together to advance security across the continent, we must be able to trust each other enough to share information that could in real time make a difference in protecting the lives of our citizens. To this end, the Conventional Forces in Europe Treaty needs our attention. For more than 20 years, the CFE Treaty has been a cornerstone of conventional arms control, transparency, and confidence-building. But this valuable regime is in danger of crumbling. Two years ago, Russia suspended the implementation of the CFE Treaty, while the United States and our allies continue to do so. The Russia-Georgia war in 2008 was not only a tragedy but has created a further obstacle to moving forward. We must not allow the transparency and stability that the CFE regime has provided to erode further. We should revive discussions on the way forward with our allies, Russia, and other signatories. Our goal should be a modern security framework that takes into account developments in Europe since the original treaty was drafted, limits military deployments, and strengthens the principles of territorial integrity, non-first use of force, the right of host countries to consent to stationing foreign troops in their territory. It is only through such an approach that we can provide the reassurance that no country is secretly preparing its forces to attack another. I meet with foreign ministers and defense ministers and heads of state on a regular, ongoing basis. And there is still a great deal of concern on the part of Central and Eastern Europeans that something may be happening they’re not aware of, that some action may be taken that is directed at them. So to achieve our goal of greater transparency, we will consult closely with our allies on how we can best put this fundamental principle into practice. Fifth, people everywhere have the right to live free from the fear of nuclear destruction. The nuclear arms race that characterized the Cold War cast a shadow over the lives of people everywhere, especially those living in Europe and the United States. I remember very well as a child doing drills in my school that, in retrospect, were absurd but were meant to prepare us in the event of a nuclear attack. Getting under one’s desk, for example. Well today, the United States and Russia are close to concluding a new START treaty to dramatically reduce the size of our strategic nuclear arsenals. But now we face increased threats – that nuclear materials will fall into the wrong hands or that certain states will develop or even choose to use them. In his speech in Prague last year, President Obama declared the long-term goal of a world without nuclear weapons. As long as these weapons exist, the United States will maintain a safe, secure, and effective arsenal to deter any adversary, and we will guarantee that defense to our allies. But we will begin the work of reducing our arsenal. And as we do so, we will spare no effort to prevent the spread of nuclear weapons and to secure existing stockpiles and materials. In April in Washington, President Obama will host a Nuclear Security Summit to draw high-level attention to the threat posed by nuclear terrorism and to galvanize support for tough measures to secure vulnerable nuclear material across the globe. And in May, we will reaffirm and reinforce the Nuclear Nonproliferation Treaty at its review conference. And we continue to work with other nations and the United Nations to halt the proliferation of nuclear weapons and materials to terrorists and non-nuclear states. We will seek to ratify the Comprehensive Test Ban Treaty and to negotiate a Fissile Material Cutoff Treaty. And we are conducting a comprehensive Nuclear Posture Review to chart a new course that strengthens deterrence and reassurance for the United States and our allies while reducing the role and number of the nuclear weapons we have. We will continue our intensive efforts to prevent Iran to prevent Iran from acquiring nuclear weapons capability. And I applaud President Sarkozy’s leadership on this issue, which will continue when France assumes the presidency of the United Nations Security Council next month. Sixth and finally, true security entails not only peaceful relations between states but opportunities and rights for individuals who live within them. A secure nation defends human rights and allows its citizens to select their leaders. It allows citizens to express their views freely and participate fully in public debates, both in person and online. It offers its citizens the opportunity to live in healthy communities, receive an education, hold a job, raise a family if they choose, travel freely, and make the most of their God-given potential. Development, democracy, and human rights comprise a mutually reinforcing cycle that is critical to security everywhere. When that cycle is broken, a nation is not secure. The essential building blocks for long-term progress and prosperity are missing. And we have seen with countries such as Yemen that one nation’s struggle to maintain order and provide for its people has consequences beyond its borders. A country that stifles its people’s voices, suppresses dissent, and asserts authoritarian control over citizens, is not a strong country but a weak country, no matter the size of its army or the scale of its ambitions. Now, Europe understands this, that security is about more than military might, that it is also about human potential. In Europe, security is provided by an array of institutions – including NATO, the European Union, the OSCE – that provide the full range of tools to meet common challenges. Consider the former Communist countries of Central Europe, now democracies that offer their citizens a better quality of life. They were drawn to the EU because of the political, economic, and social opportunities it represents. They received legal, social, and technical assistance in building democratic institutions and the rule of law. They inherited the riches of a single market and the unifying experience of a common European identity. These are such powerful forces for progress and stability. Europe has harnessed them through the creation of effective institutions. So now the United States works with NATO, the EU, and the OSCE to extend this kind of comprehensive human security to other places. We are continuing the enterprise that we began at the end of the Cold War to expand the zone of democracy and stability. We have worked together this year to complete the effort we started in the 1990s to help bring peace and stability to the Balkans. And we are working closely with the EU to support the six countries that the EU engages through its Eastern Partnership initiative. We stand with the people of Ukraine as they choose their next elected president in the coming week, an important step in Ukraine’s journey toward democracy, stability, and integration into Europe. And we are devoting ourselves to efforts to resolve enduring conflicts, including in the Caucasus and on Cyprus. in Afghanistan. European and American voices speak as one to denounce the gross violations of human rights in Iran. European and American governments and non-governmental actors operate together and in parallel to promote economic and democratic development in Africa. And we look forward to doing even more together as the EU develops its capacities for global engagement, including by sending its own highly qualified diplomats to serve alongside their counterparts from individual European nations. Our combined efforts can help put an end to the scourge of human trafficking, a threat to public safety and a crime that degrades and dehumanizes its victims. We believe that our commitment to expanding opportunity compels us to reach out to those who too often go unseen and unsupported, particularly in countries marked by poverty, political oppression, and violent extremism. Women and girls, who are one of the world’s greatest untapped resources, deserve our investment in their potential. There’ve been so many studies about how raising the status of women produces greater development and greater stability. We also strengthened – we wish to strengthen the ability of the OSCE to defend and promote human rights in the world. The commitment to human rights enshrined in the Helsinki Final Act is one of the best things that the Euro-Atlantic community has accomplished together. Now we are called to renew that commitment by empowering the OSCE to increase its work in the world. So we are coming forward with proposals for strengthening its efforts in three areas – military, economic and environmental, and human rights. We support the creation of an OSCE crisis prevention mechanism that, in situations of tension between OSCE states, would empower the OSCE to offer rapid humanitarian relief, help negotiate ceasefires, and provide impartial monitoring. We also propose that the OSCE chair-in-office have the capacity to facilitate consultations in the case of serious energy or environmental disruption, dispatch special representatives to investigate reports of egregious human rights violations, and provide a forum for emergency consultations. Looking back on all we have achieved together over the past 65 years, it is remarkable how much has been accomplished – Europe emerging from the ruins of war to become a showcase for peace and opportunity and prosperity. The condition of modern Europe, however, is not a miracle handed to the people of Europe. It is the result of years of careful, courageous work by leaders and citizens, in this country and others, to create institutions and erect policies that brought together former adversaries and united them in common cause. Now it is our turn. It is our responsibility to continue that tradition of leadership and renew those institutions for a new era. As we proceed, let us remember why we began this project in the first place, and why it is still vitally important today. This partnership is about so much more than strengthening our security. At its core, it is about defending and advancing our values in the world. I think it is particularly critical today that we not only defend those values in the world. I think it is particularly critical today that we not only defend those values, but promote them; that we are not only on defense, but on offense. There is so much that the West has to be proud of and to lay a claim to. We believe and we have the evidence to prove it that democracy works and can deliver for citizens if leaders are committed to the enterprise, and if democracies are about more than just elections; if we build institutions of independent judiciaries and free media and protection of minority rights and so much else, that we have worked and labored to create. SECRETARY CLINTON: Here comes a microphone. QUESTION: (Inaudible.) Madam Secretary, we hear very often that America and the EU should be complementary with (inaudible) that have not yet reached this complementarity. What should be, then, from your views to achieve better complementarity between these two organizations? SECRETARY CLINTON: Thank you very much. I would start by saying that these, of course, are decisions for the Europeans to make with respect to the EU. When it comes to NATO, I think that greater integration on the European continent provides even more opportunity for the level of cooperation to increase. We value our bilateral relationship and we will always maintain them, stay focused on them, because even in a time of greater European integration, there are obviously differences when it comes to certain national matters that have to be respected. But I think, given the complexity of the world today, closer cooperation and more complementarity between the EU and NATO is in all of our interests to try to forge common policies – economic and development and political and legal on the one hand in the EU, and principally security on the other hand in NATO. But as I said in my remarks, they are no longer separated. It’s hard to say that security is only about what it was when NATO was formed, and the EU has no role to play in security issues. Take, for example, energy security. I mean, it would be the EU’s responsibility to create policies that would provide more independence and protections from intimidation when it comes to energy markets from member nations. But I can also see how in certain cases respecting energy, there may be a role for NATO as well. So as we refashion, rethink the way forward in this century, I think we should respect and honor the foundation institutions, but we should be unafraid to ask a lot of the questions about how can they function better. And certainly, when one thinks of NATO as a response in the Cold War to the Warsaw Pact nations which no longer exist in the form that it was, and with the new threats that we have to confront, the strategic review that is now ongoing by NATO which will be presented at the NATO summit in Lisbon at the end of this year should be a hard rethinking. I mean, if it just repeats that we have to do better what we’ve always done, it will be a lost opportunity. And under the Lisbon treaty, with more focus and specific leadership attached to foreign policy and development assistance, there will be a way to better coordinate. So I think that your question is a very timely one and one that calls us to be creative and to work closely together and hopefully make the changes that are called for. QUESTION: I’m an American so I’ll put my question in English. Thank you for coming, Madam Secretary. Amy Green, Ph.D. student in political science here in France. Given the interconnectivity of global challenges, it seems evident that the United States and Europe, in the context of NATO, can’t solve all the problems alone. Is there support in the Administration for extending the boundaries of NATO to non-Western countries, emerging powers like Brazil, India, other democracies that might fulfill their criteria? SECRETARY CLINTON: I think there is an awareness of the global nature of a lot of these problems, but a great reluctance to go beyond the geographic reach of NATO. Now, we still have work to do in the Balkans. There are issues regarding Georgia and Ukraine’s aspirations. So there are still a lot of areas that require attention from NATO. But your question really raises an important issue: How do we cooperate across geographic distance with countries in other hemispheres, different geopolitical challenges? And there is a modern living example of that with the NATO ISAF commitment in Afghanistan. There are many reasons on the substance, I would argue, why this is an important mission for NATO. But clearly, there were more countries than just NATO members who have a stake in a stable Afghanistan. So as Australia sends troops, we are working through how to coordinate with non-NATO members. And I think that in addition to the substantive commitments, there will be a number of lessons learned from how that worked and what didn’t work going forward. In many ways, it’s quite remarkable, the success of this alliance. Yesterday at the London conference on Afghanistan, as you know, the United States, under President Obama, has agreed to put 30,000 more troops in Afghanistan. And member nations, NATO and ISAF – the international partners – have come up with a total of 9,000 more troops. How you integrate commands, how you utilize the different contributions that countries are making is a leadership and management challenge. But I think it’s an important test for the world. NATO is leading the way, but NATO has to determine in what ways it can cooperate with others. I think that the world that we face of failing states, non-state actors, networks of terrorists, rogue regimes – North Korea being a prime example – really test the international community. And it’s a test we have to pass. Now, there are some who say this is too complicated, it is out of area, it is not our responsibility. But given the nature of the threats we face, I don’t think that’s an adequate response. Take cyber security, for example. We have to figure out how to cooperate not just in physical space, but in virtual space. The threats from cyber security breaches, concerted attacks on networks and countries, are likely to cross borders. We have to know how to defend against them and we have to enlist nations who are likeminded to work with. Similarly, with energy problems, attacks on pipelines, attacks on container ships, attacks on electric grids will have consequences far beyond boundaries. And it won’t just be NATO nations. NATO nations border non-NATO nations. So how do we begin to re-imagine the world that we’re in, not just try to keep adding to the structure of the world we inherited? When you mention countries like Brazil and India, how do we find common cause? Now, the U.S. peacekeeping missions are a very important way to combine military under UN military leadership for countries that might not be able to take on a mission themselves, but with combined capacity, can. Brazil, under a Brazilian general, has done an excellent job in leading the UN peacekeeping operations in Haiti for a number of years, providing the only source of solid, sustainable security as they work to train a police force. There’s no army in Haiti. So honing one’s skills so that they could be put to work, I think, will be one of the responsibilities we have to address. And finally, there’s a tremendous opportunity for us to improve our disaster mitigation and response abilities. We have a lot of common desire to respond to disasters, as we’ve seen in the wake of Haiti. Countries immediately sprang into action. I commend France for the excellent response and the aid that was sent. The disaster relief could not have been done solely by civilians. It’s impossible. The disaster consequences were so profound that without military assets, there is no way food, water, or rescue missions could have been delivered. So how do we better coordinate? No matter whose military it is, no matter whose flag it’s under, how do we better coordinate? How do we think this through? And that is something that countries across the world should be interested in addressing. So there are so many implications of what we must do, and I think it’s going to require leadership from both military and civilian experts to help us find our way forward. 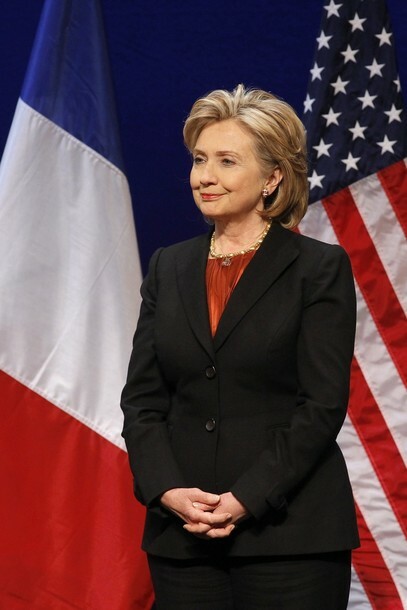 QUESTION: Madam Secretary, my name is Michel (inaudible). I’m president here at (inaudible) studies here, military school and the institute of higher national defense studies. I have a question about China: China is becoming a major global problem; I think one of your first trips was to China, and not only in economic terms. So which is the new – where is the best framework, institutional framework to not only accommodate China, but to engage it? Is it United Nations? Is it G-20, is it G-2, or EU-China bilateral relations, or maybe a mix of all that? Thank you. SECRETARY CLINTON: I think your last point is the right point. It needs to be a mix of all that. I think that there are many different institutional arrangements that would be beneficial to include China in. There are Asia-Pacific institutions that – like ASEAN, APEC, East Asia summits – that are important for China to play a role in and to be better connected with their neighbors. The G-20 is an attempt to better manage the range of problems that no existing institution on its own can do. The G-8 left too many people out. The UN is often not able to function on an ongoing basis the way that we would like. But the UN also has a tremendous capacity to bring China in around the table. So I think that the short answer is we should try many different approaches. It will be increasingly important for China to become more transparent about its military ambitions and budgets. It is difficult to create and sustain military-to-military engagement with China, but I think every institution you just named, plus bilateral relationships, should try to include that. It will take time, but I think it’s very important. I think that China has certainly made clear that it’s willing to participate more on a range of issues than it had before. During our negotiations about sanctions for North Korea, obviously the United States, South Korea, and Japan were committed to moving forward to try to alter North Korea’s behavior. But after study and consultations, so was China – a remarkably positive step for them to take. And they have been equally responsive with respect to the enforcement of Security Council Resolution 1874 which embodies those sanctions. With respect to Iran, thus far, the P-5+1, which as you know is France, Germany, United Kingdom, EU, United States, Russia, and China, has been united. Now, as we move away from the engagement track, which has not produced the results that some had hoped for, and move toward the pressure and sanctions track, China will be under a lot of pressure to recognize the destabilizing impact that a nuclear-armed Iran would have in the Gulf, from which they receive a significant percentage of their oil supply, that it will produce an arms race; other countries will feel the necessity to seek their own nuclear weapons programs; Israel will feel an existential threat to its very existence. All of that is incredibly dangerous. So the argument we and others are making to China is we understand that right now, that is something that seems counterproductive to you, sanction a country from which you get so much of the natural resources your growing economy needs, but think about the longer-term implications. We have in the last year worked very hard to establish what we call a positive, cooperative, comprehensive relationship with China. We will always have disagreements, as we will with probably any country, even a close friend like France. But with China, we want the relationship to continue despite the disagreements. So that’s – for example, if we arrange a meeting between our President and the Dalai Lama, that is a difference in perspective, a respect for his religious leadership, and we do not think it should derail the relationship. But this is kind of a learning experience for all of us, including China. China has emerged as a global leader on the world stage at a time when the world is so much more complicated. I mean, if we were in a bipolar world, everybody would know what they were supposed to do. But we’re not. So China is, like the rest of us, trying to figure out how do you protect your national interests and yet recognize the consequences for your national interests from actions outside your borders, and cooperate with others to achieve goals that actually are in your interests? It’s a complicated equation for all of us today. We had an incident I’m sure you’ve read about concerning Google and concerns about actions constraining information, which we very forthrightly presented to the Chinese in public and in private, but I made the additional point that as China grows, they will have companies that will operate globally, that will need the same kind of protection that we expect for our companies operating globally. So we’re asking for kind of an over-the-horizon view, which is always the hardest thing to do in politics, because politics is about the moment, unfortunately, too often. But I think that it’s this kind of engagement and respectful sharing of views that is at the heart of any kind of coordination or cooperation with China. QUESTION: Bonjour. So I’m (inaudible), first-year medical student. So I would like to know your opinion about the European army that France and Germany have been trying to build for the last 50 years and to know the opinion of the U.S. about this. 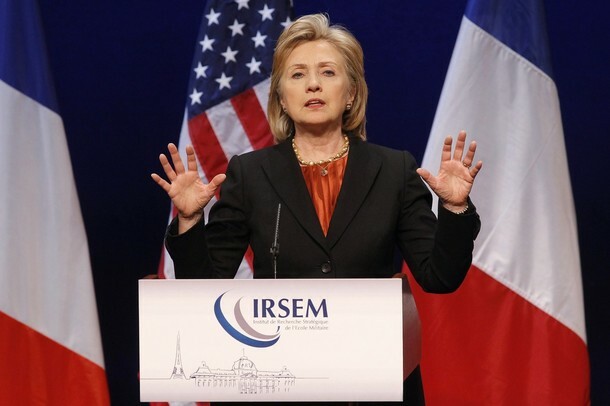 SECRETARY CLINTON: Well, again, this is a European matter. It certainly is a French and German matter. And I respect the decision making of allies like France and Germany, so it is really within those two countries’ sphere of authority. I think the U.S. view is that we would not want to see anything supplant NATO. If it were able to supplement NATO, that would be different. But given the strains that already exist on NATO’s budget and military expenditures in our countries, we think it’s smarter to figure out how to use the resources we have more effectively, use the alliance that we’re members of in a more strategic way. But again, that is ultimately a decision of the French and the German people. QUESTION: Madam, hi, (inaudible). So you mentioned among the common challenges extreme poverty and importance to strengthen the potential of women and girls around the world. And I agree that a common value that United States and Europe share is a shared vision of women, of women rights. And I know that you were a supporter of Muhammad Yunus activities in microcredit and that President Obama’s mother was a pioneer in this. So what can be the role of a cooperation between Europe and the United States on this particular aspect? SECRETARY CLINTON: Well, that’s a wonderful question because one of the areas that we would like to see greater cooperation between Europe and the United States is in development. We think that if we were more thoughtful about how we utilized our own national resources in coordination with other nations’ resources, we would get greater results. If you take any country that is a poor developing country, there’s a great spirit of generosity among Europeans and Americans. We actually help people who have no other capacity to help themselves, who are also not in countries that we consider strategically important to us, but who are suffering. And I would hope that on a bilateral basis, and now particularly through the EU with the post-Lisbon structure, we could be thoughtful about how to do that. I’ve talked a lot about this with Foreign Minister Kouchner, who of course has a great history in healthcare, and France has done wonderful work on healthcare in Afghanistan, wonderful work. The French hospital that the people of France built is now training Afghan doctors and nurses and taking care of so many people. Well, would it make sense for the United States to rush in and build our own hospital? No, it would make sense for us to support the French initiative. Yet, at the same time, we’re doing a lot of investment now in agriculture, because in Afghanistan, 60 to 70 percent of the people make their living from agriculture. And we not only want to enhance their incomes; we want to turn them away from poppy production. So we’re sending agriculture experts, we’re helping to build irrigation systems, we’re providing new, stronger seeds. We’re doing a lot. So would it make sense for France to have a parallel program? No. But to help us and bring the expertise is absolutely welcomed. So when it comes to women and girls in some of the countries that are most at risk, there is so much to be done, it’s almost overwhelming. I was in the Democratic Republic of Congo, which is the epicenter of gender and sexual-based violence against girls and women in the world right now, and there is a lot that we have to do because there is so little to start with. So we should plan together and try to figure out how we can influence the government, the military, provide protection for people on the ground and provide treatment for those who have been assaulted. Bernard Kouchner and I worked together in the wake of the terrible instance in Guinea, where government-sponsored murders and rapes took place at a peaceful demonstration. And we worked very closely together with African countries to try to work out a way to resolve the conflict without bloodshed, because we knew that among the first victims would be girls and women again. So our hope is that through our bilateral aid, we cooperate more, through multilateral institutions like the World Bank or UNDP or UNIFEM or other – UNICEF, et cetera, we really begin to put in systems of accountability to absolutely evaluate outcomes. That’s harder to do than it sounds, but we must take that on because we owe it to our citizens and our taxpayers to say look, we want to help the women of the Congo or we want to help build schools in Afghanistan, and we can show you what we’re accomplishing. We owe it to those people, especially in these economic times of difficulty when so many of our own citizens are worried and suffering. But there’s a great opportunity here, so I think that we should work together. And obviously, from my perspective, focusing on girls and women makes a great deal of sense because it’s the fastest way to get money into the hands of children, family members, communities, and I think it’s an obligation and responsibility as well.